Use this recipe and your spiralizer for quick and easy homemade curly fries, as well as two deliciously simple dipping sauces. The flavorful fries are seasoned with Old Bay, garlic powder, sea salt, black pepper, and cayenne pepper. They can be served with a creamy ketchup, which is a simple blend of ketchup and mayonnaise. Or with a homemade honey mustard made with a blend of yellow mustard, Dijon mustard, and your favorite honey. If you can't find Old Bay seasoning, use celery salt and paprika instead! These quick and easy seasoned fries are sure to be a hit either way! Per Serving: 341 calories; 17g fat; 43.3g carbohydrates; 5g protein; 4mg cholesterol; 1703mg sodium. i love old bay!! always looking for new ways to use it. very cool. 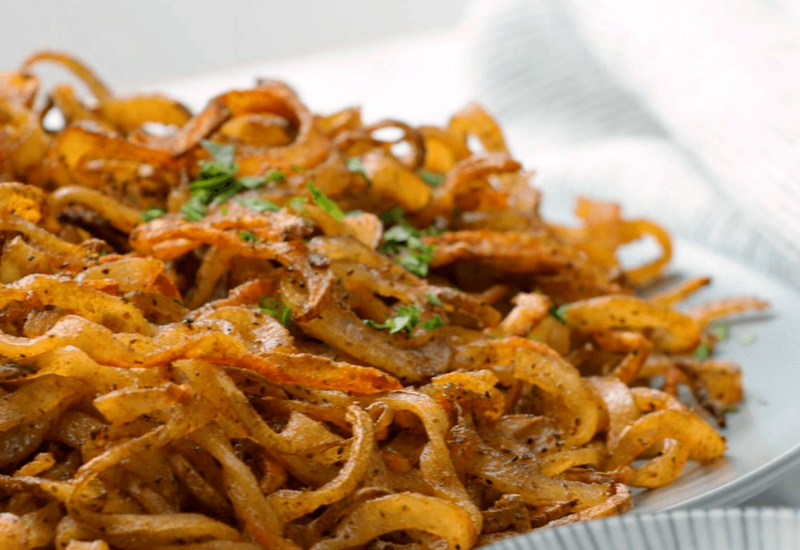 These curly fries are perfect! It will make you want to stop buying frozen and fast food fries. Not only are the easy, but they are fresh, crispy, and the honey mustard is mouthwatering. This recipe is so good! Definitely my new addiction! I could eat these all day, and the creamy ketchup , so yum! These are my favorite game day snack, I usually have to double the recipe because we watch the game and grub on these the entire time. Love the ketchup and honey mustard sauce too. The fries are so amazing!! Not a big fan of mayo, so made the honey mustard and it was a huge hit. I used two baking sheets to allow the potatoes more room for roasting.